I was lucky enough to win a copy of this last week from LT, and I can't wait for it to come in the mail! I loved Anna and the French Kiss, and I heard that Lola is even better. (Is that even possible??) I'm really looking forward to reading it! What are you WoWing for this week?? I'd love to know what book you can't wait for. Leave me a link to your post so I can check it out! I'm WoWing for this one, too!!! You are soooo lucky to have won a copy! I'm counting down the days till September 27th!!! Omg! I just finished reading Anna and the French Kiss and it was amazing. I can't wait to read this one. I can't wait for Lola. September needs to hurry! Yes! Lola! I love Stephanie Perkins and Anna was so, so wonderful. 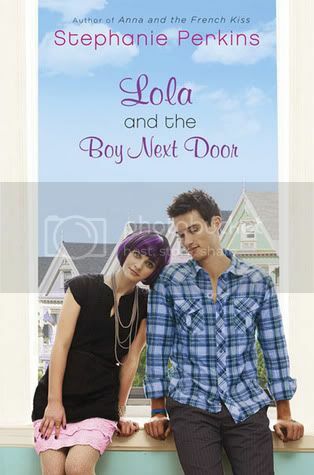 I can't wait to get my hands on Lola and the Boy Next Door! Awesome pick. This one sounds great! I haven't read anything by Stephanie Perkins as yet but she seems quite popular. This is definitely on my most-wanted list, too! I'm ashamed to say I haven't read Anna and the French Kiss! But all my blogger friends have and they say that I should too! So I'm adding this sequel to my wishlist! Definitely a much awaited book and I am anxious to read it too. Great pick! Lola being even better?! I'm not sure I can handle that! Great choice! And congrats on the win! Oh my god, now I'm sooo jealous that you won a copy. :D I really need it to be September now so I can get a copy as well. But I really hope you'll enjoy it and I'm definitely looking forward to hear what you think about it! So exciting that you won a copy! This is a much anticipated title! I really enjoyed ANNA AND THE FRENCH KISS and I hope this will be just as good! I am not sure that I would like this as much as Anna and the French Kiss (part of the magic for me with that book was the setting) but it sounds like a fun book anyway. Good pick! This one sounds like fun...thanks for sharing. Congrats on the win, and I am dying to get my hands on a copy of this. Can't wait to see what you think after you've read it! This is one of my most highly anticipated books of the year! SO excited!!! Anna was probably one of my favorite books of all time and I have a feeling this one will be right up there with it! I'm so excited for this book as well! Not much of a contemporary reader, but hope you love it when you get it! Sooooooo jealous you're getting a copy of this book! I want to read it RIGHT NOW. Actually, I want to read it YESTERDAY! :) I heart Stephanie Perkins. I will read every single book she publishes. This was my pick too! :D I can't wait!!! I won a copy of this one from LT as well. I was so excited! I cannot wait to read it. Great pick! You are so lucky to win a copy of this! Can't wait to see your review! Sounds good, enjoy your book. Love this! I am anxiously waiting on this one too. Ooooh I am jump up and down excited for Lola I've already pre-ordered my copy. I'm dying for this one too. You're so lucky to have won a copy (and I'm so jealous lool). I really can't wait. This is just the cutest cover isn't it?? Hi, Christy. Thanks for stopping by! I really wish my library would get Anna and the French Kiss. I've heard so many good things about these books and I'm sold enough to want to read them. Nice pick! I WANT THIS BOOK RIGHT NOW. I can't for September! P.S. your blog design is really cute. You know, I was pretty happy with my win of Legend at LT, but now you've gone and ruined it. I'll trade you for your copy of Lola. Please? this one i am SO excited for. Seriously! September needs to hurry up and get here! there are so many books I can't wait to read!! I cannot wait for this book!!! The September release date is killing me!! !